Build an inventory of your entire network without leaving a chair! Total Network Inventory will scan your entire network, query all servers, workstations and appliances discovered, and record important information about every piece of hardware found on your network. Make a perfect, effortless, hassle-free inventory. The network inventory builder is able to query all network devices no matter how large or diverse your network is! Do you know the number of workstations still running Windows 95 or missing the latest updates? 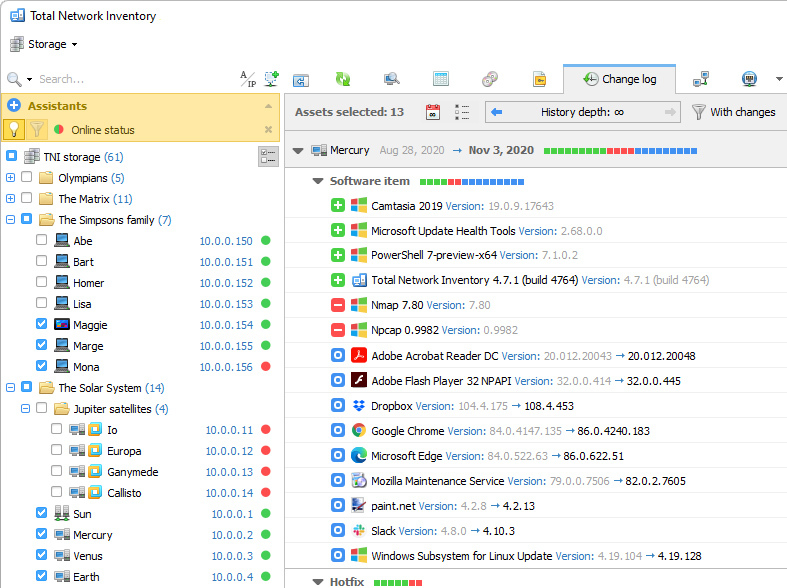 Total Network Inventory obtains essential information about each and every computer on your network in real-time including information on all service packs and hotfixes applied. The network inventory builder will store and organize information, providing you with a comprehensive report on a chosen subject in just a few clicks. With Total Network Inventory, all information about your network equipment is right at your fingertips! Have a budget to spend on hardware upgrades? With Total Network Inventory, it's easy to figure out the oldest computers on your network. Just run Total Network Inventory, let it scan your network, and click to generate a comprehensive network inventory report detailing components used in each and every PC on the LAN. Click once more, and you'll see the oldest PCs appear on top of the list. It's just that simple! Total Network Inventory can scan your entire network remotely, without you having to leave a chair or installing anything onto the PCs being scanned. Using Total Network Inventory is safe and secure; no data will ever leave corporate premises. Thanks to the step-by-step Scan Wizards, scanning your entire LAN to make a network inventory is as easy as clicking "Next". Detailed reports are easy to produce and a breathe to read, providing important information about your network inventory presented in a simple way. Network Map, Asynchronous mode of scanning SNMP devices and other useful new features, Many improvements, Huge number of fixes! network inventory, pc audit, hardware inventory, software inventory Total Network Inventory will scan your entire LAN, query all servers, workstations and appliances found, and log essential information about every piece of equipment. A perfect inventory without leaving your chair.